This image (which I believe originated as a cartoon at Doghouse Diaries) has been repurposed many times. 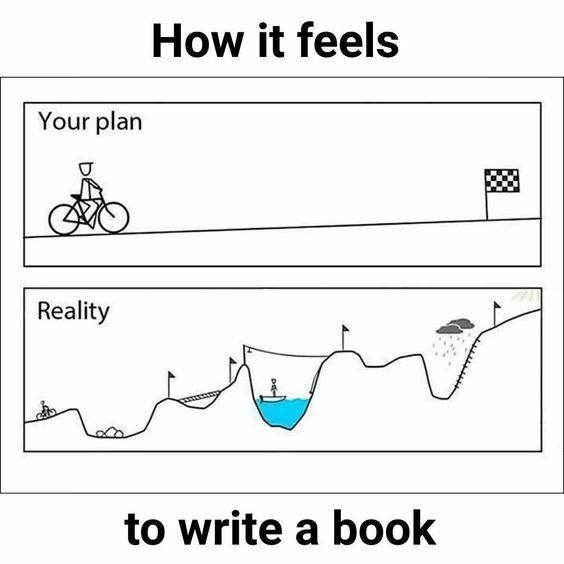 In this case to accurately depict the feeling of writing a book. Any writing project can get bogged down, not just writing books, but the amount of story you need to assemble and make work to create a novel is a much more daunting task than a short story. It’s not just the fact that it’s a longer project. The challenges of a short story are different than the challenges of a novel. A short story can be read in brief period of time, not giving the reader much chance to forget things revealed at the opening of the story, for instance. A reader is more likely to spread the reading of a novel over a number of days, so details in chapter one are more likely to fade from memory by chapter ten. So sometimes you want to find subtle ways to jog the reader’s memory of earlier events. I’m not the kind of writer who starts with an outline. I often start stories without a clear idea of whether this thing that’s occurred to me is going to be a short story, a novella, or a complete book. Very rarely an idea will hit me, I’ll sit down and start typing, and some hours later I have reach the end of a short story. More often what happens is I write for several hours stopping at a point where I either have to stop to go to bed or work or something else, having only then figured out that what I’ve got is a longer story. Even then, I don’t usually stop to do an outline until I hit a serious snag. At that point, I can map out what I’ve written already, start identifying emotional arcs and so forth, and as I make all of that explicit in the outline, start seeing how these various bits might be made to come together in a satisfying conclusion. How far are they willing to go to get what they want? And don’t just answer those questions for your protagonist. Answer those questions for any villains in the piece and all the supporting characters. I often find the solution to what seems to be a complete dead-end on a plot is to change which subplots cross the hero’s path when. Another important tool is simply to re-read everything I’ve written before. I had a book-length story moving along a while back, everything going according to plan until I hit this one big snag: I needed two of the characters (specifically, two of the villainous characters), to go to a particular place so they would literally cross the path of some of the other characters. Except I could think of no logical reason they would go there at that point. I really spun my wheels on that for a while. I even tried re-outlining the story from scratch to see if I’d notice something different. While re-reading everything I’d written thus far, two tiny details that I had put in the descriptions of two parts of the story leapt out at me. I had put them in simply because they seemed to fit the mood, and I was trying to give the reader a good image of the characters. But each detail implied a couple of things that I hadn’t consciously thought as important to the plot. And while I didn’t originally intend the two details to be related to each other, I realized if I went with the explanation that did relate them, it gave me a perfect opportunity to drop some new information in the laps of the two characters–information that would send them out to retrieve something, and put them where I needed them when I needed them. I don’t think that my subconscious put those two details in for that reason originally, but when I found it, it did seem almost miraculous, like a finding a secret bridge across a seemingly impassible chasm in the plot. And once I had that connection between those details, it made several other things later in the book easier to explain. And frequently, while I’m re-examining those character arcs, or reviewing the outline and comparing what I’ve already written to the plan, I find little gems like that buried in the scenes. A detail or a throw-away line or maybe just a coincidence that I can exploit to leapfrog the plot ahead. Sometimes, in order to keep putting one word in front of the other, we have to go looking in the muck for something we can repurpose. Great advice. I usually start with a brief summary of a story, rather than an outline, but that is often just due to the fact that I jot summaries of each good story idea I get. I usually get ideas at inconvenient times, so I jot down as many details as I have in my head, so I don’t lose them. Even so, the story will often move away from my original ideas.